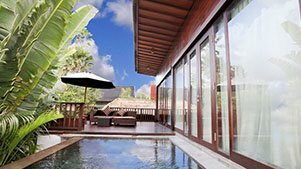 "Welcome to Our Official Website , Check our Offer and Book Direct"
A stylish seminyak villas for Romance, family and gathering - perfect for travelers seeking intimate and lovable moments to bond with their loved ones. 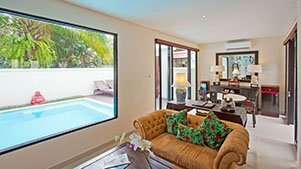 Located at the center of Seminyak close to very famous place in seminyak, Four on Drupadi Seminyak Villa is a private pool villa with option of one , two and three bedroom. Experience a unique home style living in the six different villas within the compound with well-spaced garden,Spa and Gym to accommodate your stay and within walking distance to all the fun and leading places that creates your perfect Bali boutique villa vacation. Excellent location , Guests loved walking around the neighborhood!
" We booked four nights at the pyaar villa as part of our last few days I’m Bali and were sad we didn’t spend more time there! 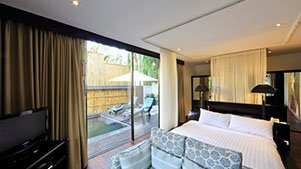 The villa has 2 bedrooms and bathrooms with huge dining area and lounge. Everything is beautifully decorated in Indian style. " " The staff are excellent. Cheerful. Friendly. Diligent. The Breakfast setting up every morning, was a nice touch. The themed villa was very cool with appropriate jazz music playing when we all walked in. " " The staff are excellent. Cheerful. Friendly. Diligent. The Breakfast setting up every morning, was a nice touch. The themed villa was very cool with appropriate jazz music playing when we all walked in."